Hunting is a world leader in developing premium connection solutions to meet the ever increasing demands of the world’s oil and gas industry. By developing solutions to cover a comprehensive range of the most severe applications and environments, Hunting is comfortably positioned as a leading manufacturer throughout the industry. Our expertise is further enhanced by a leading edge engineering team and an unsurpassed attention to design, quality, and service. A versatile, integral two-step connection for standard weights of tubing. Metal-to-metal seals provide pressure integrity greater than the burst and collapse ratings of the tubing body. TS-HP is a versatile, integral two-step connection for standard weights of tubing. Metal-to-metal seals provide pressure integrity greater than the burst and collapse ratings of the tubing body. 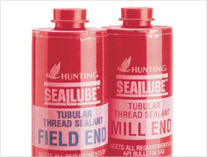 Hunting SEAL-LOCK XP is designed for all types of workstring and production tubing applications. The connection features a metal-to-metal, gas tight seal, dual torque shoulders and a tapered 5-pitch, "hooked" thread form. SEAL-LOCK APEX is a threaded and coupled non-upset premium connection designed to provide internal and external pressure integrity under extreme loads. SEAL-LOCK BOSS is a threaded and coupled casing connection designed to be cost competitive with API Buttress. SEAL-LOCK GS is a threaded and coupled non-upset connection designed for light to mid-weight tubulars in geothermal applications. SEAL-LOCK HC is a threaded and coupled non-upset connection designed for light to mid-weight tubulars. SEAL-LOCK HT is a threaded and coupled tubing connection designed for high torque and deviated hole applications. The SEAL-LOCK HT-S Timed connection is ideal for fiber optic and smart well applications and where tool orientation is critical. The SEAL-LOCK XD is a proprietary hooked-style thread form that is highly suitable for extreme critical well applications where bending, pressures and compression forces are high. Hunting's CWC threaded and coupled connection is engineered and manufactured to withstand connection fatigue associated with the rigors of drilling with casing. SEAL-LOCK FLUSH is a flush OD premium connection with metal-to-metal seal, hooked thread form and external torque shoulder for liner applications. SEAL-LOCK Semi Flush is an integral casing connection that utilized the latest in Finite Element Analysis and physical testing technology during its development. The WEDGE-LOCK SF is a proprietary wedge-style thread form that is suitable for highly deviated and directional wells requiring downhole rotation where extreme tension, compression and bending loads are high. Dual metal - to - metal radial seals deliver full body ratings in both internal and external pressure. TEC-LOCK™ BTC connection system is a close-tolerance threadform with shouldering pin noses that eliminate the open “J” area, creating a flush ID for turbulent free flow and reduced tool hang ups. TEC-LOCK™ BTC-S connection system is a close-tolerance threadform with shouldering pin noses that eliminate the open “J” area, creating a flush ID for turbulent free flow and reduced tool hang ups. TEC-LOCK™ Wedge provides premium performance at a semi-premium price. TKC MMS EUE LTC BTC is the "standard of the industry" when it comes to internally coated downhole tubular connections. Flush O.D. for Optimum Clearance: Integral connection with a flush outside diameter provides maximum clearance for slim hole applications. The TKC 4040 HO (Convertible Ring) and HOI (Integral Ring) are non-upset threaded and coupled connections that combine our "4040 thread form" with our patented TKC center ring, to create an internally flush bore and axial metal-to-metal seal connection. Fox™ is an advanced premium threaded connection for tubing, casing and line pipe. Its innovative thread geometry achieves substantial reductions in peak tooth loadings both on make-up and in tension. JFEBEAR™ has been designed and tested to withstand today's toughest well conditions. JFELION™ has been designed and tested to withstand today's toughest well conditions. SealLube™ thread sealant is an anaerobic compound that in the absence of air and presence of metal converts from a viscous resin into a solid polymer. PRESERV-A-THREAD™ is an environmentally friendly corrosion inhibitor for threads and seals. 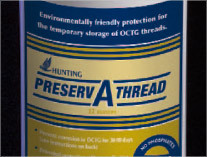 Hunting Composite manufactures industry-renowned protectors for API and premium threadforms and can be combined with Hunting PRESERV-A-THREAD™. Hunting's Annular Pressure Relief System (APRS) engages proven "burst disc" technology to assist in management of Annular Pressure Build-up (APB).